Marvelous Multiagers! : New Glasses and Oviraptor Eggs! Today my new glasses came in! They are a lot different than my old ones so they will take some time to get used to but so far I like them!! 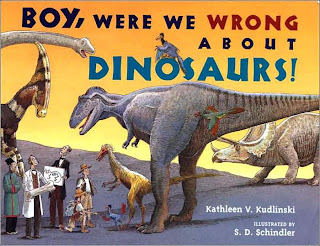 We are in the middle of our dinosaur unit and today we talked about how paleontologists continue to make new discoveries that change their thinking about dinos. The kids really thought this was cool - that even adult paleontologists learn new things and change their minds! I read a few pages of this book to accompany what was in our science text. It's a great book! We learned that scientists used to think that Oviraptors stole other dinosaurs' eggs, but they later determined that Oviraptors were actually just protecting their own eggs. My class called it "babysitting"... haha! 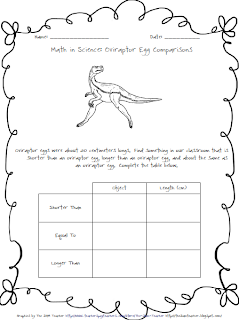 To integrate our Oviraptor info with math, we learned that Oviraptor eggs were about 20 centimeters long. Then we measured around the room and found objects that were longer than an egg, shorter than an egg, and about the same length as an egg. This isn't my original idea (I borrowed it from the book), but I did make a little recording sheet that you can use if you're interested! Just click on the picture to have it. I also decided to start a "Homework Club" for kids who bring their homework back every day finished. At the end of 2 weeks, whoever has brought their homework back finished every day will be able to have lunch in our room and I will show 20 minutes of a movie or something. I have a few kids (4 or 5) who never do their homework so I keep them in from recess to do it unless they can get it done before we go outside. I hope this will encourage them to do it at home instead of playing Wii for 4 hours............ we'll see how it goes! You are the cutest thing ever! I have done a "homework club" sort of thing before. I actually just let the kids who have finished all of their work (when we have a lot and I am tired of the kids who are lagging) watch a movie, while the other kids finish their work behind the television. It is AMAZING how fast they complete their work when the movie is ticking away. You're adorable in your glasses. I'm wearing mine right now but no one will ever see me in them. Ever. Love your new glasses - super cute! Great book. I think I'll read it with my class this month sometime. Congratulations on getting glasses. Homework Club, huh? That really looks like a good idea to motivate kids in doing their homework.